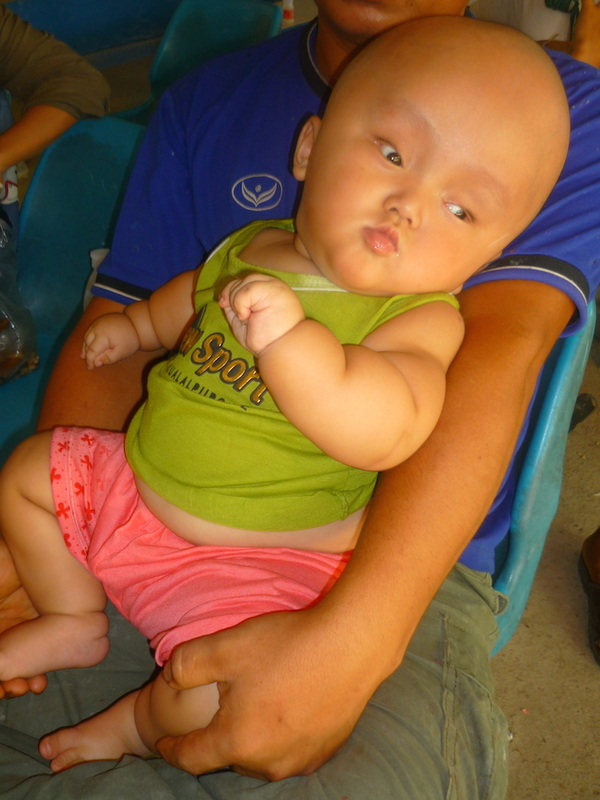 Ka Nyaw is a 1 year-old-baby who came to BCMF suffering from hydrocephalus. Hydrocephalus is a condition caused by an abnormal buildup of cerebrospinal fluid in the skull and can lead to convulsions, vision problems and mental disability. If left untreated, hydrocephalus is a fatal condition. Ka Nyaw first showed symptoms of his condition when he was four months old, when his grandmother noticed that his head was swelling and that he was unable to breathe properly through his nose. Since then, with the continued buildup of fluid in his skull, his head has grown significantly and he has developed a dry cough. Ka Nyaw’s enlarged head has made it impossible for him to play and learn as children his age should. He must be held, or else left lying on his back at all times since he cannot support his head. Ka Nyaw’s parents left their village where they were farmers in Karen State to find work in Bangkok three years ago. His father has a migrant passport, allowing him to legally work in Thailand and earns 300 baht ($10 USD) per day working as an electrician. Ka Nyaw’s mother worked as a housemaid and earned 6,500 baht ($205) per month. When Ka Nyaw was born, they left him with his grandmother in Burma so they could continue to work in Bangkok to support the family. However, one month ago, upon hearing about his worsening symptoms, Ka Nyaw’s parents quit their jobs and returned home to look after him. They became increasingly worried about his condition and after hearing about Mae Tao Clinic from a relative, decided to seek treatment for him in Thailand. The trip took one full day and cost 30,000 Kyat (US$ 30). After Ka Nyaw was examined by Mae Tao Clinic medics, they referred him to BCMF so he could be sent to Chiang Mai for investigation and treatment. Together with his mother, Ka Nyaw travelled to Chiang Mai and stayed there for an extended period of time while he underwent treatment. At Maharaj Nakorn Hospital, Ka Nyaw had an x-ray and was admitted to the hospital for one night. He and his mother then went to stay at the BCMF patient house where he stayed for 8 days before returning to the hospital for a follow-up appointment. On April 22, 2013, he was admitted to the hospital and underwent an operation to insert a VP shunt in his head to allow the cerebrospinal fluid to drain from his skull. However, 6 days later, he developed a high fever because of an infection. The shunt was removed and Ka Nyaw was moved to ICU for 19 days. On May 15th, he was moved to the regular pediatric ward where he was put on IVs and antibiotics for the next 3 months. On August 2nd, the doctor again performed surgery to insert a second shunt and prescribed medication to treat pain, prevent infection, and prevent convulsions. After the second operation, Ka Nyaw couldn’t sleep because he was regularly running a fever. His mother had trouble sleeping as well because she was so worried about him. Ka Nyaw was discharged from the hospital on August 31st. However, he again developed a high fever and needed to be readmitted to the hospital on September 19th when he also developed pneumonia. After he recovered, he was again discharged from the BCMF patient house and after he returned to the hospital for a follow-up appointment, doctors confirmed that he was finally healthy enough to return home. 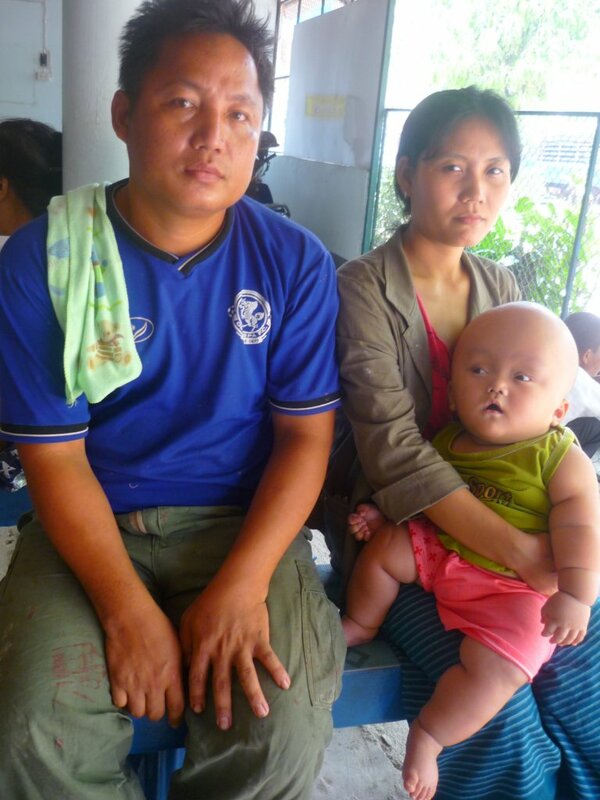 Before the surgery, Ka Nyaw had difficulty breathing through his nose, but this problem resolved after the surgery. The swelling in his head is reduced and he can now move his head freely. He used to frequently have problems with fever and coughing, but now he is much healthier than before. Ka Nyaw’s mother says she knows that he may not be able to speak or grow up to be like other children, but she thinks he is lucky to survive. Ka Nyaw’s family is very happy that he has received treatment. They are much less worried than before and his mother says that without the help of BCMF donors and staff, they couldn’t have afforded their son’s treatment. She said that without the help of BCMF, her baby would have died by now. She also wants to say thank you to the donor who donated a stroller to them because Ka Nyaw was too big—and his head was too heavy—for her to carry him. She intends to take care of her son for the rest of his life. She hopes to see her son sit or stand up on his own in the near future.